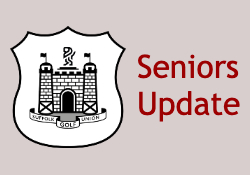 Suffolk Seniors have two further friendly matches planned against Hertfordshire at Aldeburgh Golf Club on Thursday 18th April and Essex at Colchester Golf Club on Wednesday 24th April. The team for Hertfordshire is -Stephen Whymark, Roger Taylor, Steve Crosby, Trevor Hellyer, Stephen Duffety, Steve Mann, John Booth, Nigel Robson, Kevin Brooks (Captain) and Graham Shillings. The team for Essex is-Simon Bearman, John Booth, Stephen Duffety, Nigel Robson, Adrian Studd, Gary Seaman, Alan Middle, Peter Revell, Andy Ball, Bob Richardson, Keith Tarrant and Giles Oates.